Since discovering that I am a targeted individual, I learned a lot. I am writing this blog to help out. I know there are other targeted individuals out there who are struggling. Who are probably being drugged, being institutionalized and who are homeless or at risk of becoming one. They are being harass daily 24/7 and maybe contemplating on giving-up. Please do not cave-in. This is what I learned, and hopefully will help you to keep your spirit up and to keep on fighting. Targeted individuals will experience a decline in health during the harassments. My research indicated that there are three stages of harassments. The first is the preliminary surveillance followed by intense organized stalking/mind game and then the harmful electronic harassments using direct energy weapons. Although the second one normally will result in targeted individuals’ being institutionalized and heavily drugged, the last stage was the most harmful. A game of chess, a chase of sanity – one targeted individual indicated that the whole harassment/targeting is a “mind game.” The perpetrators main goal is steal your sanity. They want you to know they are there. They want your undivided and constant attention. In short, they want you to be paranoid and delusional. You have to learn to block them from your consciousness. Do not give them gratification. Take Charge of your Thoughts – It is your brain, It is your thoughts. They are going to whisper ideas, commands, visual pictures, all masquerading like your own thoughts. 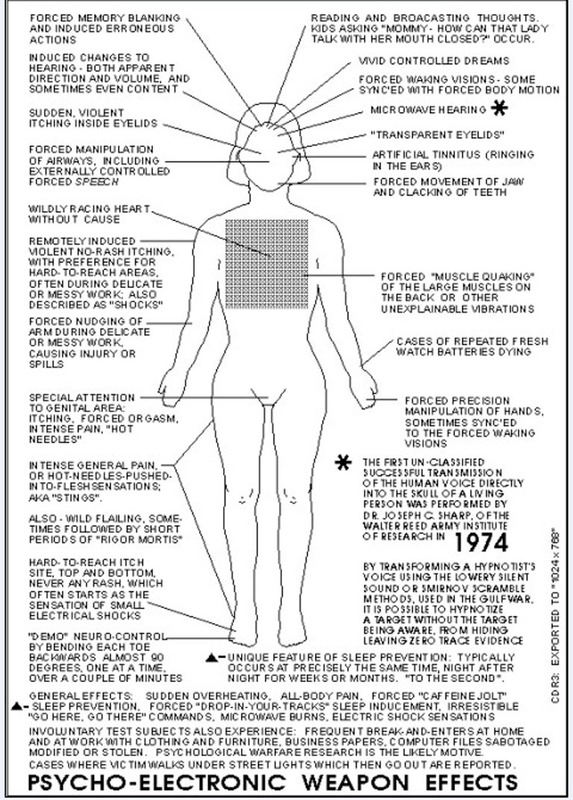 They will eventually informed you that it was them who put these pictures, ideas, commands, in your brain. Ignore them. Own it. Its your brain, its your thoughts. While this may take some time to practice, your “core beliefs” and personal mantras will help you figure this out. Take charge, take the credit, own it. Own the positive. Own what you think is yours. Own what will make you feel happy. Own what will benefit you. And then give away all the trash, the filth, the negative thoughts. The one that will harm you. Negativity – Control your thoughts, once they starts the negativity, stop! If you find yourself starting to think fearful or have negative thoughts, fight with pleasant thoughts. Aside from being poison once in awhile, “Negative Thoughts” are more poisonous. These thoughts are the perpetrators first tactics. To induced negativity in your psyche. 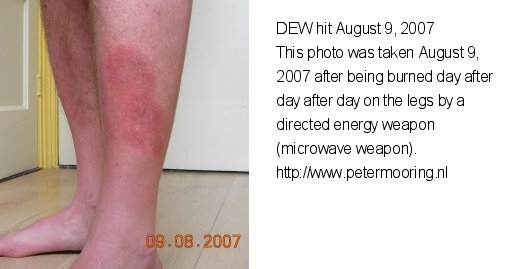 DEW Attacks – Targeted individuals will be attack with direct energy weapons, mostly in a form of electro-magnetic radiations in different body parts, including eyes, arms, head, face, stomach, feet, legs and genetalia. It will come from everywhere and mostly will feel like a pulse vibrations. 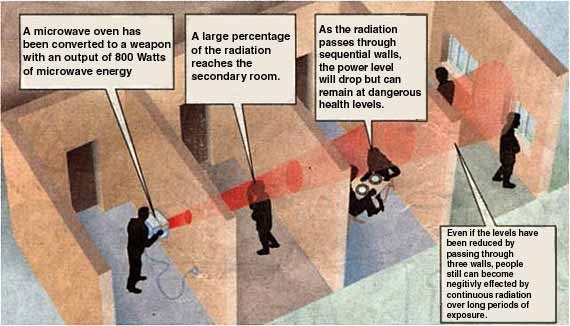 Most of the time, when there is an electrical grid, the radiations will appear. When it comes to this, use shielding products to minimize the harmful effects. You will also experience, ringing in your ears, tinnitus. Music will ease the pain but eventually you will get use to this. You will also noticed that sometimes you will stare at something for example, while surfing the web, you will all of the sudden stare at your monitor for a specific period like staring on a blank screen, this is hypnosis and part of the electronic harassments. With practice, you will be able to snap out of this. This will follow by a quick pain in your chest (heart area) or pain in your forehead and glassy eyes. Pains – Deal with immediate pains with things you find in your household instead of prescription drugs. If your pain is intense and you don’t mind the smell, used Vicks ointment. Put it the area where it hurts. You can also use thermal carrier hot and cold bag. Put hot water in the thermal bag and wrapped it with towel and put it in the area where you feel pain. If your headache or body pain is really bad, try hot shower then take the minimum dosage of over the counter pain remedy like Advil or Tylenol. You will need to help your body to undo the damage of electromagnetic radiation with consumption of fruits and vegetables that are rich with Anti-oxidants. Watch your diet. Normally, targeted individuals will have a high sugar diet. Also, exercise. Do house chores (avoid using vacuum cleaner if your voice to skull harassments are intense). Walk. Informed Consent – If you can avoid, do not go to psychiatrist. If you can avoid, do not take anti-depression pills. Do not take Paxil. Be aware of a sudden change in your mood. Emotions like sadness, shyness, anxieties are not an automatic sign of mental disorder or chronic depression. These are normal human emotions. If your prescription drug has several side effects and these side effects are more compare to the benefits/cure, if you can, do not take it. Be very aware of the additional prescriptions drugs intended to remedy the side effects of your original medications. This is a normal cycle targeted individuals experience. If this is happening to you, be very weary. Voice your concern. Learned about “informed consent.” If you are forced to be institutionalized, your have the right to know all aspect of your treatments. You have the right to know your medications. You have the right to know the reason why you are there. If you can, learned to walk away. MOST IMPORTANT – This is the most important advice that I will give you. With the combination of daily stalking, electronic harassments (radiation), voice to skull harassment, and psychotropic drugs (normally anti-depressants), there will be a big chance, you will be coach to commit suicide. No matter what you hear, particularly the unwanted voices, DO NOT COMMIT SUICIDE! This is the perpetrators’ ultimate prize. Induced Dreams – While I am still investigating about how to deal with induced dreams, you will get familiarize with the pattern. Most of the time, they will induced dreams relating to your past and will do “role-playing” acts while you are sleeping. They are reading a script patterned to the information and on-going harassment protocol they gathered. The main goal is to induced negative thoughts, the feeling of shame or guilt are the most common example. The success of induced dreams will be carry forward to targeted individual’s harassment particularly once he or she woke up. These are mostly the negativity embedded in one’s brain or mood. Hence most of the time, targeted individuals wakes up feeling sad, tired, or fatigue. Some indicated that they felt like they had a hanged over. Other will developed cold or allergies due to the lack of “real” natural sleep or rest. Sleep Deprivations – Some targeted individuals deals with sleep deprivations with nutrients (eating bran oats) and meditations. All are effective way to induce sleeps naturally. Another way, are to not just lay in bed and stare at the ceiling. If one is not in a vegetable state, get up and do something. Cleaning is a way of taking charge. Doing something to counteracts the thoughts of “you cannot sleep” or when the perpetrators are in a state of rambo or running “amok” as they continue to attack you with non-stop trash talk about non-sense. Once you done something, It will eventually tired you out that physically your body will shut down and hence will make you feel sleepy. Targeted Individuals – Are They Really Crazy?